Here a workman poses with his steam drill under the Broad Street Bridge, shortly before the first explosive blast is to be touched off. 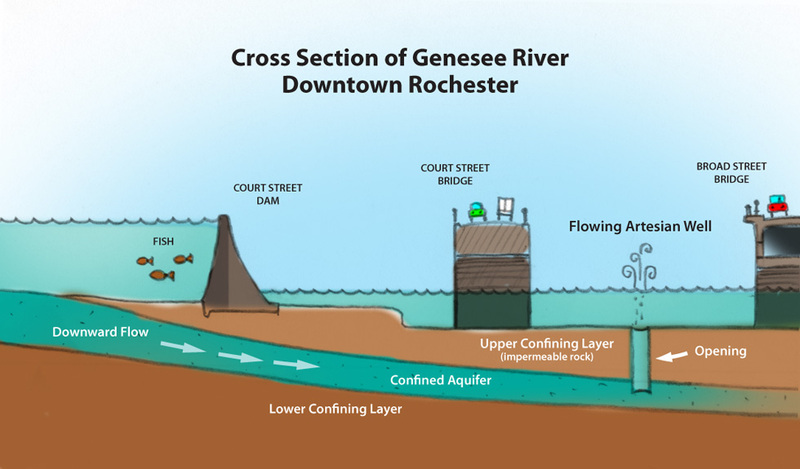 The river has been drained and will be deepened to help prevent future floods in downtown Rochester. Take note of those holes he’s drilling. Concrete flows down a chute from a concrete mixer on the Andrews Street Bridge. It flows into wheeled hoppers that move on railroad tracks to the work area. Men work from narrow wooden platforms filling concrete forms with sand bags. 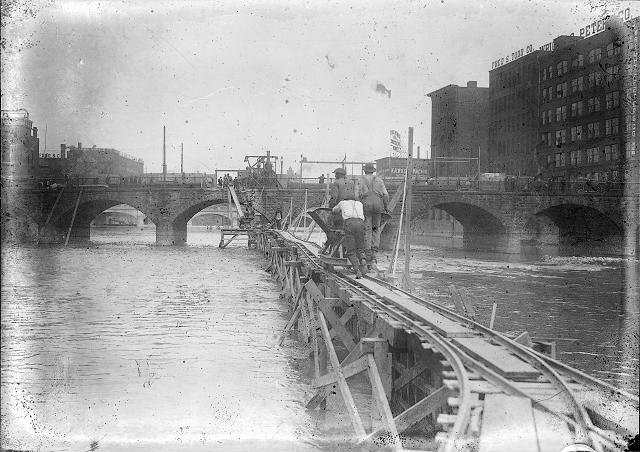 Three workmen push a hopper along a raised trestle in the middle of the Genesee River. The hopper moves along a set of tracks located between the Andrews Street Bridge, where a concrete mixer waits. Diver Pat Welch goes down in the Genesee River bed to check for leaks in the walls of the cofferdams. The cofferdams will keep part of the riverbed dry for the river deepening project. Okay, so that sounds like a reasonable explanation for triangles. But why is this one spewing water like a natural spring? To find out, I turned to Bill Chaisson. Bill holds a Ph.D. in Geology. When I showed him the photos he immediately recognized it as the “Artesian effect.” AH HA! Uh… dur… what the hell is the Artesian effect? When water flows out of the ground on its own, without pumping, that is known as an Artesian Well. The name “Artesian” is derived from Artois, France, where such wells were sunk as early as 1126. The water works its way down into permeable rock, like limestone or sandstone, underneath the damn. This porous stone is sandwiched between a top and bottom layer of impermeable clay or shale rock which keeps the water pressure high. So wherever that water can find an opening, “it will gurgle up” to the surface. Remember the photo of the workers drilling into the river bed? Those holes have provided an escape route for the pressurized water beneath the rock… and VOILÀ!! Rochester has its very own Artesian Well. Fascinating! Thanks to Tom Hack and Bill Chaisson. And thanks to Michael K. for asking the tough questions. UPDATE: A commenter on Facebook pointed out another triangle at the Sister Cities pedestrian bridge. It seems this one was part of a fountain that worked for a few months in the late 1960’s when the bridge was new. It clogged with silt and stopped working. The triangle discussed in this post is from a much earlier time period. It can be seen in photos from the early 1920’s. This entry was posted on Friday, September 27th, 2013 at 8:00 am	and is filed under Rochester History, Transit + Infrastructure, Urban Exploration, Video. You can follow any responses to this entry through the RSS 2.0 feed. You can skip to the end and leave a response. Pinging is currently not allowed. Wow. I swear this is the most awesome website on the Intertubes. Thank you for labeling the fish I was very confused. but seriously this is interested. I like learning about this type of stuff. wow, I was just looking at this on saturday. Thank you for reading my mind and answering my questions before I could think of them! That must have been a ton of work. UPDATE: A commenter on Facebook pointed out another triangle at the Sister Cities pedestrian bridge. It seems this one was part of a fountain that worked for a few months in the late 1960’s when the bridge was new. It clogged with silt and stopped working. So that begs the question… was this triangle near the aqueduct bridge also a fountain? I think I’m just as confused as I was before. Thank God for this website and the people who work so hard on it. For all the people in Rochester who really do care about the history of our city, we thank you for answering all the questions we thought we would never find the answers too. Love this site……. Thanks @Mike. It’s just me – one dude. Anyone can do this stuff. It’s great fun. I used to work by the Sisters City bridge at the old Chamber of Commerce and always wondered about the old fountain there. I’ve been searching for ANY pictures of the thing actually in operation, and have come up with nothing so far. If you ever find anything, be sure to post it! I’d love to know what the fountain actually looked like ON! Cool. Mystery solved by research and great writing. Thank you for the very interesting, offbeat articles about old Rochester. I really enjoy reading them and seeing the pics of old blogs etc.. The Rochester Public Library is offering “River to Roof” Tours of the Rundel Memorial building this weekend for the city’s River Romance. Friday Oct. 4 at 2pm and Saturday Oct. 5 at 12:30 and 2:30. If you like the old library and its relationship to the river, this tour is a must! Call 428-8350 to make a reservation. The malfunctioning fountain is “Front Street’s Revenge.” Or, it could be that nobody cared about fixing it because nobody noticed it to begin with. When I was young I lived in Gates. We used to take a bus down Lyell Ave. to Broad St. We would ride the subway from Lyell Ave. to South Ave. There was a natatorium on South Ave. For a quarter we could swim all day. There were showers & locker rooms.There are a number of stories about the street cars & subway. 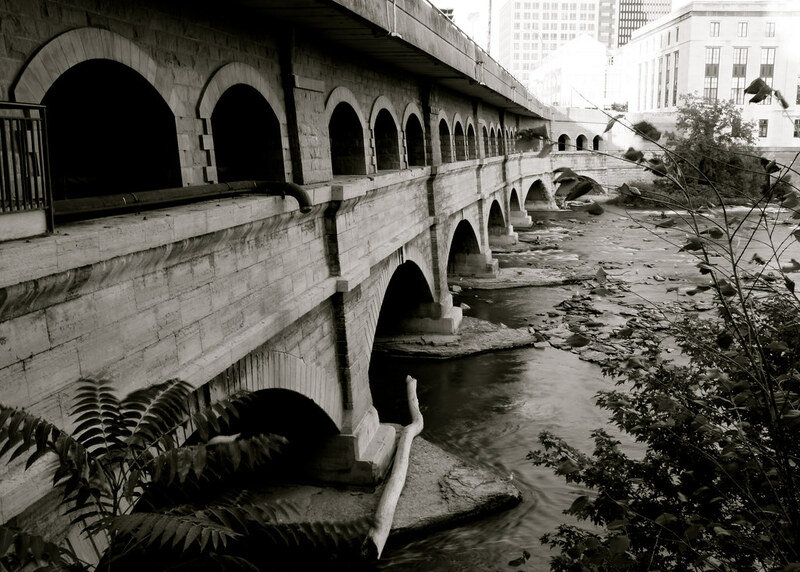 in the 30’s and later,we kids in Rochester were fascinated by the big snapping turtles sunning near Broad st. bridge.I an going back a bit…being 90 years oldin 2013! Wow! has Rochester changed since I left48 years ago! I just found a book that talks about Rochester’s forgotten fountain by Donovan Shilling. 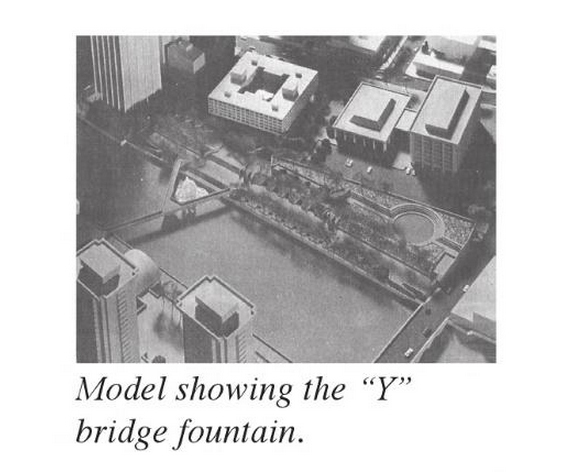 It includes a small photo of a model that shows the Sister Cities Bridge and fountain. The passage talks about how the fountain was turned on for a brief moment by the engineers who installed it. Water gushed 40 feet in the air. But the next time they flipped the switches to turn it on, nothing happened. The contractor, already in the hole seven to eight thousand dollars, gave up on the project after estimating it would cost another six thousand to fix the electrical problem.